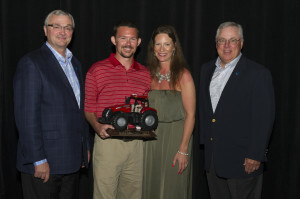 DES MOINES, IA – Ryan Justus, Commercial Lines Agent with Premier NW Insurance located in Clackamas, Oregon, was recognized at the Nationwide® Agribusiness Insurance Company national sales conference held in Fajardo, Puerto Rico, as one of the company’s leading writers of farm insurance. Premier NW Insurance is an On Your Side® Farm Certified Agent. The annual FAST Track Conference was held in recognition of top-producing agents in sales of new farm insurance policies during the 2013 calendar year. While more than 6000 agencies write farm insurance for Nationwide, only 87 qualified for the 2014 FAST Track Conference.